How clever! Dresden Plates are on my agenda....eventually..
Gorgeous, Dresden Plates are too scary for me to try. Yours are wonderful. That sure is an easy way to make dresen plates. I love Dresdens and yours look fabulous! Well done! Your first Dresden Plate is lovely . . . the colours are really fun. The next two look like there could be a Christmas quilt coming on! I love your lovely LOVELY dresden! I, too, have that ruler in the drawer, still in the package. . . Your Christmas-y Dresden is wonderful. Looks like you've learned a wonderful new skill. Do you plan to make more Lovely plates? More Christmas plates? Both?? Your Dresden Plates are wonderful! This quilt is on my to-do list one day. Very nice LuAnn! Be careful, they can be addictive! These are such fun blocks! For some reason, I love that photo of the half made green block! Wow you have made a wonderful Dresden plate and I love your vibrant colours.. The 2 next one are lovely too and the Christmas look is clear.. 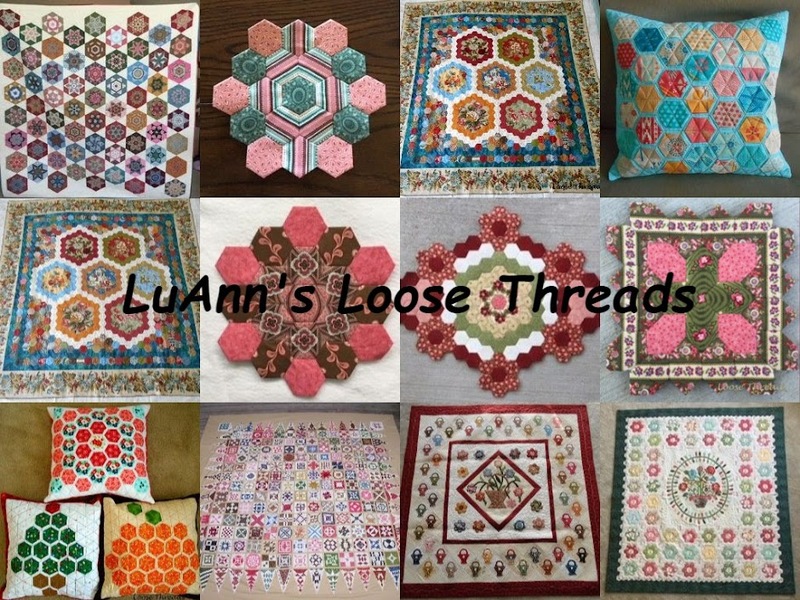 Thank you for playing with me, I had lots of fun and it is especially inspiering to do this with you Luann!! I have another Dresden plate ready today but it looks very similair to the first one so I will not post it. Hmm and what am I going to make with them, I do not know. Maybe a bag or maybe a little wall quilt but then I will need 2 more plates.. I never thought of using a jelly roll for a dresden plate, neat idea! Love the colors in yours.....now I want to add that to my list of projects. Oh what fun. I am so glad you are having so much fun with a new to you pattern. I think the green looks terrific, but it is hard to argue with green and red for Christmas. It is nice to know that jelly rolls work for Dresden Plates. The red looks so bright and pretty with the green! These look absolutely lovely. I just may have to add the Dresden Plate to my list of projects to try someday. Right now I seem to be in overload with graduation coming. Love the dresdens, LuAnn, especially the Fresh Flowers, I am likin' those brights right now. You did a great job sharing the math information, too. That was my challenge, to cut from the 2 1/2" jelly roll I had, and make the finished plate in an 8" square. Math is so necessary, huh? Thanks for the math lesson for jelly rolls. I have yet to buy myself a jelly roll but I will someday! Isn't that just the easiest way to make Dresden's!! That's the way I make mine. Love yours!!! Especially perfect for Christmas! I like your reds with the greens. Thanks for the great info on the Dresden blades. I just did a purse using a charm pack....love the idea of a Jelly Roll too! It's no secret that I LOVE dresdens!!! Pretty. Love Dresden Plates and yours look wonderful. Yes, Dresden Plate is on my agenda as well...I particularly love the first one in the bright springy colors! Very nice! thanks for sharing that info about making dresdens with jelly rolls. I have one of those rulers and one day I am going to make a dresden plate quilt. It is one of my favorite designs. Those look fun. I love Dresdens. I have that ruler but haven't gotten my rear in gear to use it yet! oh my, i love Dresden Plate patterns! thanks for sharing.